In this article, we'll talk to you about the delights of discovering the Spanish capital on a bicycle. If you prefer a slightly less conventional mode of transport for getting around the capital and would also prefer something that's both healthy and eco-friendly, then we definitely suggest trying to see Madrid on a bicycle. 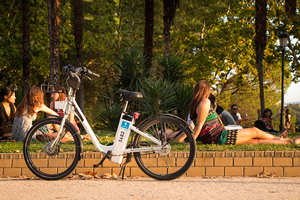 Since 2014, the city has had access to a public electric bicycle rental service which is known as "BiciMad." This service offers some 2,000 cycles and 165 docking stations that are spread across the inside of the M-30 ring road. Choosing this option will give you greater freedom of movement around the city centre, particularly when visiting some of the most important sights. You won't have any difficulties with picking up or dropping off the bikes as the docking stations can be found approximately every 300 metres. The system for hiring these bicycles is very simple. You can do it via the web page: www.bicimad.com or by down-loading the App on your mobile phone. You can opt for a pass that covers up to a year or you can acquire a pass that is valid for 1, 3 or 5 days. In the event of choosing the latter, which is more common if you are only going to be in Madrid for a few days, all you have to do is to find the nearest docking station and look for the option that best suits your needs on the ticket machine. The pass that you purchase will be payable at the end of the period you have chosen based on the actual usage you have had from the pass. As a guarantee of payment, €150.00 will be blocked on your credit card and whatever balance remains unutilised will be credited back to your card at the time that you effect payment for the service that you have used. Each time you want to pick up a bicycle, you just have to hold your card in the place indicated in order to be able to unlock the bike. Prior to removing the bicycle you will just need to check the colour on the base of the docking support for each vehicle. If the light is green, this means that you can remove the bicycle and as you hold your card up close to the machine, you will hear a beep which means that, with a gentle tug, you can remove the bicycle from its support. When it comes to returning your cycle, you will just need to find one of the support bases at the station that has a red light. You can then return the bike to its support station until you hear a beep of confirmation and the light returns to green again. If you go to pick a bicycle and you find that the light is blue, this means that it has already been reserved and is therefore unavailable. The bicycles are electric but using them is very easy. On the handlebars, there is a red ON/OFF button which switches the bicycle on and off. There is a blue button that says "LIGHT" which is how to control the lights. And lastly, there is a green button that says "MODE" which is how you can regulate the power levels. There are three levels: LOW, MED or HIGH depending on your needs. In addition to this, on the right of the control socket, the bicycle's battery level is shown. Madrid is a city that is constantly adapting to changes and this is being done with a view to sustainability and greater levels of cleanliness and modernity. Using a bicycle will undoubtedly be in line with this ethos. Because Madrid is such a large city, inevitably the traffic can be extremely heavy as a result of which, more and more people are opting to use a bicycle. In order to further encourage this, the Local Government is promoting a mobility plan which will improve the usage of bicycles. Amongst other features, one of the objectives is to create some 430 kilometres of cycle routes across the city. As a tourist, you will have the advantage of being able to travel around at your own speed without having to wait for any means of transport and you will be doing this in a healthy fashion too!